Children act out especially when they want attention. That’s normal. What isn’t normal is when they behave in ways that would have you mentally, physically and emotionally exhausted. Being around children is challenging. And although it’s also very rewarding and fulfilling to mold minds whether you’re in the teaching profession, child care business or as a parent, you’ll have very tough days to face when it comes to kids with autism. You may also see Analysis Templates. When students show undesirable behaviors or act out in ways that are beyond any teacher or staff’s control, most educational institutions have processes in place for situations that takes some serious reckoning, or when faced with cases that are impossible to resolve within standard classroom practices. Part of such processes often involves writing a functional behavior assessment or analysis (FBA). 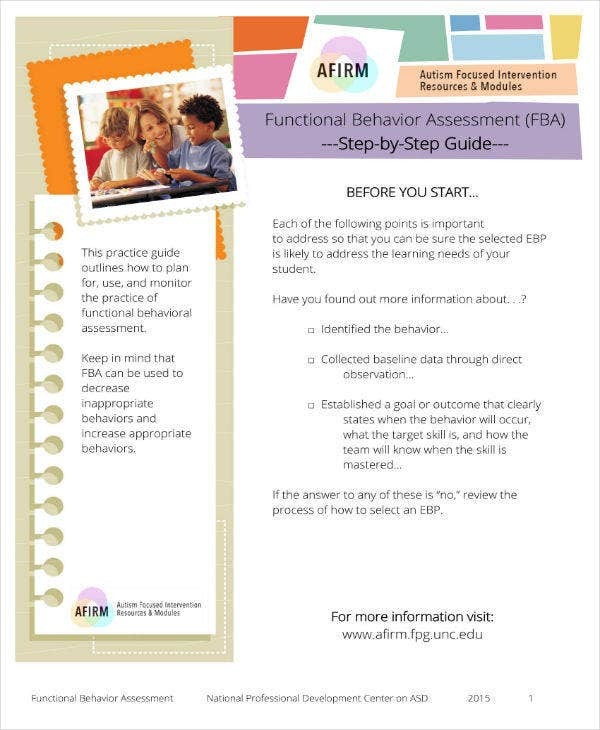 Currently, more and more IEPs are encouraged to conduct FBAs as part of their strategies. You can also like audience analysis templates. For Albert Einstein, “The definition of insanity is doing the same thing over and over again but expecting different results.” And while this may be true, depending on how you interpret it, parents and teachers still fall prey following the same pattern when dealing with a child’s difficult behavior. 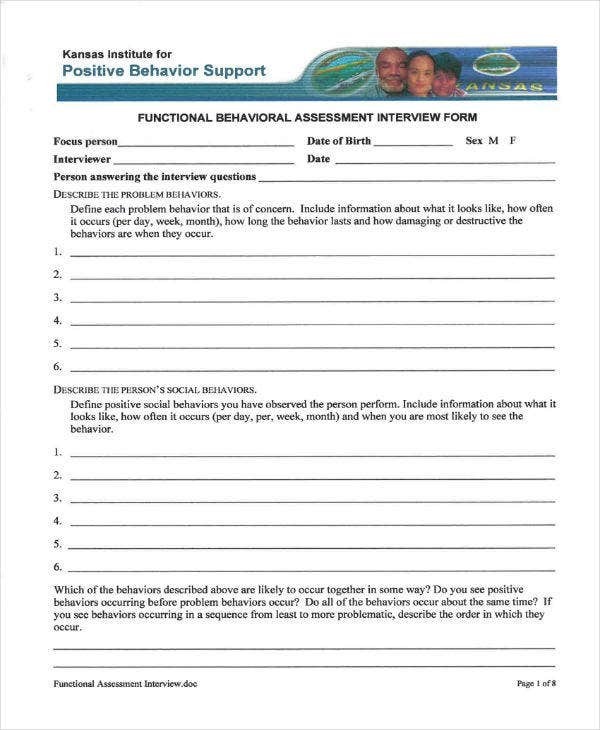 If you aren’t getting the results you expected with what you currently have as child behavior management strategies, it might be a good time to consider a functional behavior analysis as an applied technique of trying to evaluate significant (mis) behavior. The analysis would lead you to the right therapy giving more focus to welcoming new techniques in reducing problem behavior. It’s pretty common for both parents and teachers to proceed to skill acquisition in the application of this techniques when it’s their first time but in order to effectively teach new skills, you have to prioritize addressing the difficult behavior. You can also see fault tree analysis. We already know that a child’s behavior can be a stumbling block for their academic and social success, thus this analysis further encourages parents and teachers as well as caregivers to give more attention to behavior reduction and management techniques which would only be possible after completing a functional behavior analysis. 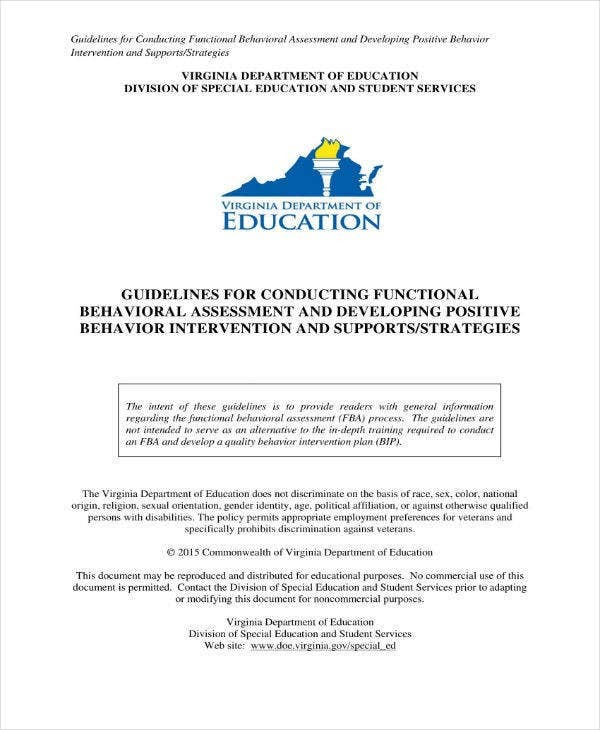 What is a Functional Behavior Assessment/Analysis? While most people can determine what type of problem behavior they want to address in order to control or manage tantrums or aggression, especially with kids who have autism, the reason for such behavior is usually not revealed until after conducting a functional behavior analysis or assessment. To look beyond the behavior and how serious it is would be a crucial step in maximizing the (positive) results of behavioral interventions conducted. You can also like company analysis report templates. Behavior does not happen in a vacuum and this is true to understanding all types of behaviors, including the most difficult ones our kids manifest. In order to develop an effective behavioral plan, it is important to have a good understanding of the certain environment fostering the behavior. It is also just as important to identify the “whys” of negative behavior exhibited by our kids. What is the child trying to tell you, or achieve by resorting to challenging behavior and what are the possible alternatives we can give them? True to its name, part of the analysis is to acquire the behavior’s function. 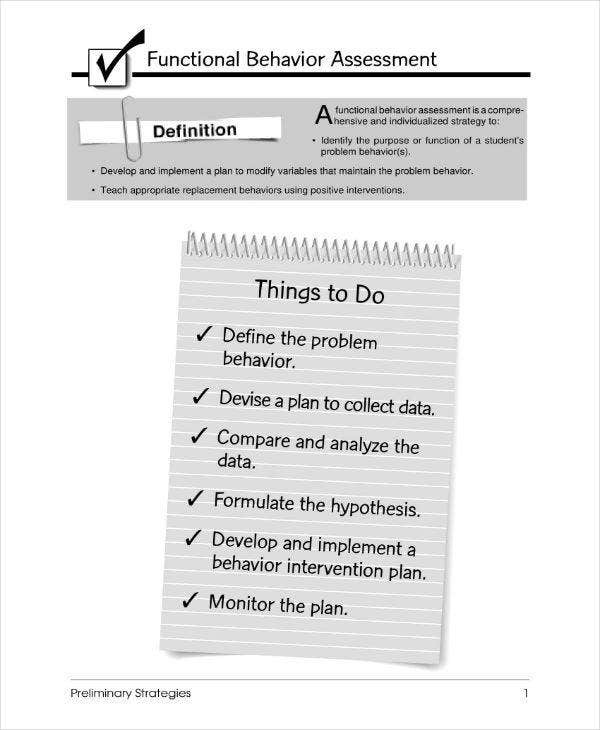 You may also see behavior analysis templates. Failure to base the intervention on the specific cause (function) very often results in ineffective and unnecessarily restrictive procedures. You may also like customer analysis templates. For example, consider the case of a young child who has learned that screaming is an effective way of avoiding or escaping unwanted tasks. Using timeout in this situation would provide the child with exactly what he wants (avoiding the task) and is likely to make the problem worse, not better. Without an adequate functional behavioral assessment, we would not know the true function of the young child’s screaming and therefore may result in selecting an inappropriate intervention. You can also read market segmentation analysis templates. 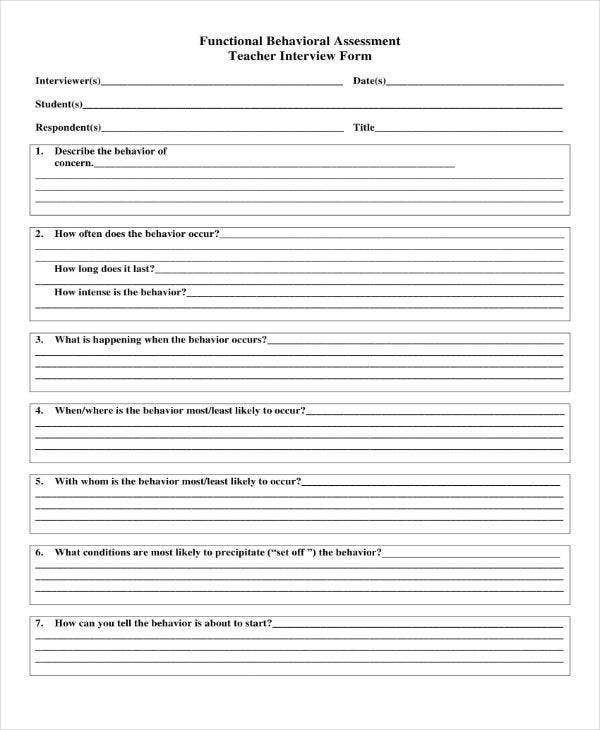 If you’re tasked to evaluate your students’ behavior using FBA in order to see how you can address them and you haven’t written one before, the idea of completing one can be intimidating, especially if you aren’t familiar with the concept of such analysis and its intended purpose. You would have a difficult time trying to effectively contribute to the said process as a result. You may also like sample customer analysis templates. 1. 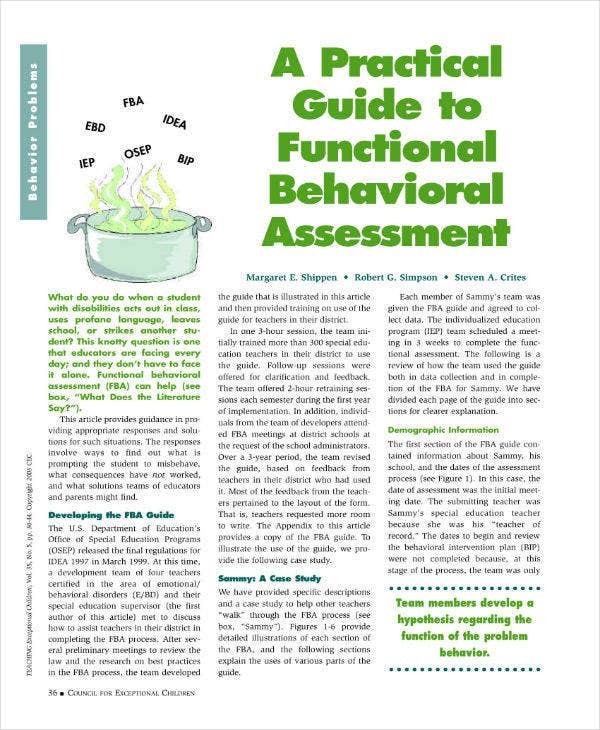 A functional behavior assessment is exactly what its name says. 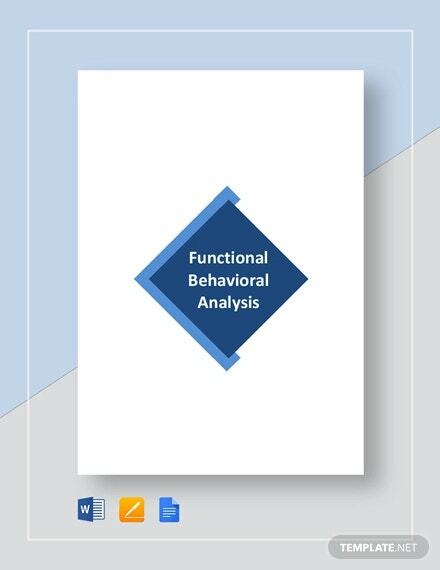 Functional: An FBA is based on the behavior’s “function”. The function answers the “why” to the student’s behavior. “Why is the child behaving this way? Which lead us to this truth. That everything we do has a function. That there is a reason for everything we do, there is a purpose. If you scratch an itch on your leg, it is to relieve yourself of that itch. When you go to work and do your job because you expect to get paid for it. Appreciation would be a bonus. You can also like research analysis samples. Behavior: You also need to discuss what behavior is and your definition of a behavior should be something clear for the other person to know exactly what you mean and what it is you’re talking about. You can also like SWOT analysis templates. 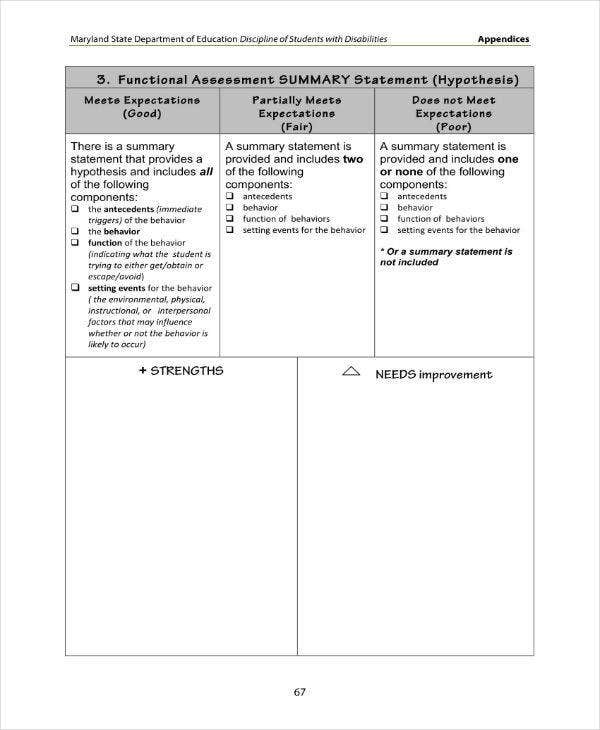 Assessment: In assessing behavior, you must secure information that would be useful later to check if the intervention is effective or working. Data can be collected in various ways depending on the type of behavior you need to analyze and evaluate and how often (frequency) the behavior occurs. You can also like financial analysis samples. 2. Define and clearly describe the difficult behavior in clear terms. For instance, you have a student who throws objects. Are you saying he’s throwing toys or notebooks directly at you, on purpose? Those two don’t necessarily mean the same behavior and can be categorized as two different things. It is therefore very important to clearly discuss the behavior you are seeing to make sure all parties involved in the analysis are on the same page on what is being described. You can also like product analysis reports. Attention-seeking behaviors: These type of behaviors have the end goal of getting another person’s attention and it’s usually the most common function and is an art that children have mastered ever since they got out of the womb. Doesn’t a baby cry to get his parent’s attention? Doesn’t yours cry when it wants to be fed? One of your friends talks to you and your 5-year old suddenly tugs at your skirt begging for something. When it comes to a child with autism, it’s more than likely you’ll be repeatedly hit until you stop what you’re doing to pay attention to her. You may also see process analysis templates. Escape/avoidance: This time, behaviors have a goal of removing something unwanted or considered undesirable. You may witness a child tearing his drawing or homework in pieces so that he may not finish it. Your female student may run to the library to avoid bullies and another student with autism may shut his eyes tightly when he refuses to see any more of what’s in front of him. You can also like trend analysis templates. Access to an object: In this behavior, trying to access an object may have you witnessing a child trying to tell you something he cannot or refuse to put in words. A toddler may be pointing to the TV and shout “Dora!” Someone with a communication system could give someone a picture of a snack and so on. You can also like gap analysis templates. Automatic: Function in this type of behaviors is quite challenging to determine because seeing the benefits from an outside view is impossible. When there’s something bothering us inside our body, we tend to find remedies for it or do something to relieve us of what we feel. We a cough, scratch an itch and blow our nose when we have colds. However, those who have autism have a different way of dealing with being uncomfortable. We see them rocking, banging their heads on the wall or flapping their hands. These activities somehow provide the person an automatic relief by making their bodies more comfortable. You can also like data analysis templates. 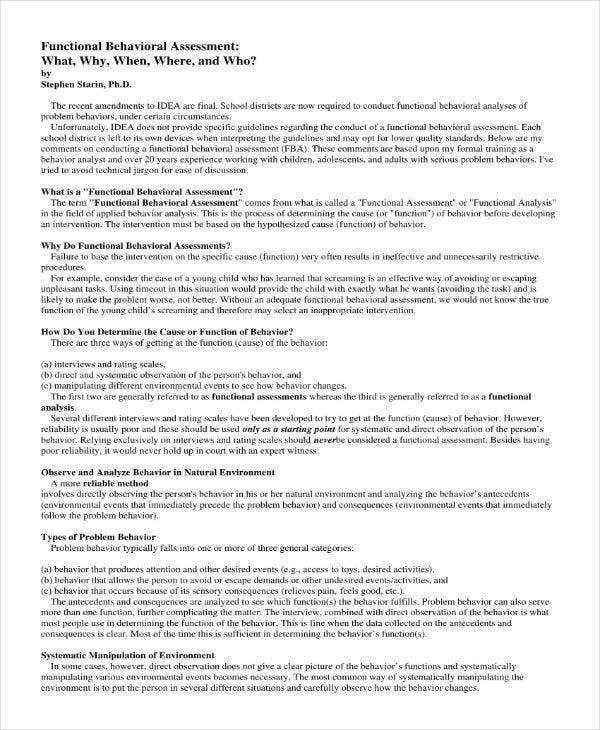 We can then say that a functional behavioral analysis takes more than just a team of people with stacks of paper sitting around, looking at children or people with problem behaviors trying to find the cause. While it is very important to collect data from significant people in someone’s life, this is not enough and it’s also not enough to just watch a child for sessions at a time in coming up with a behavioral plan either. Although the analysis takes time and a great deal of effort as well as research to get a sound result, it is usually a time well spent since the intervention following the analysis would be more likely effective than anything developed without careful reasoning or any level of expertise and careful factoring of behavior functions. You may also see situation analysis templates.